Most people love getting takeout Chinese food for dinner once in a while. I know we do it about once a month and there are always standard favorites that we like to get with the meal. Egg rolls are always a given and Michelle and Sean love to get wonton soup, but one thing the whole family loves is the fried rice you can get. While I like all of the fried rice I am always partial to pork fried rice myself. There is something about the taste of the rice with the bits of pork that is just perfect for a Chinese food meal. I have made fried rice before at home and while it never quite comes out just like takeout, it gets pretty close. Of course I don’t have a commercial kitchen, stove and overhead vents to do everything they can do, so I have to make do with what I have. When we had some leftover pork from dinner the other night I decided to use a piece and try this fried rice recipe from Sam Sifton at New York Times Cooking. Of course, this recipe doesn’t have any pork in it originally, but it also doesn’t have some of the other vegetables I added to it to make it a well-rounded dish of vegetables and rice. Put 1 tablespoon of the oil in a wok or a large skillet, and turn the heat to high. When the oil begins to shimmer, add the onion, pepper and carrots and cook, stirring occasionally, until the vegetables are softened and beginning to brown, about 5 to 10 minutes. With a slotted spoon, remove the vegetables to a bowl. Drain the peas if necessary and add them to skillet; cook, shaking the pan, for about a minute, or until the peas are hot. Remove them to the bowl with the other vegetables. Put the remaining oil in the skillet, followed by the garlic and ginger. When the mixture is fragrant, about 15 seconds later, add the rice, breaking up any clumps with a spoon as you go along and tossing it with oil. When the rice is well coated, make a well in the center and break the eggs into it. Scramble the eggs, then stir them into the rice. Return the vegetables to the skillet and stir everything together to integrate it all well. Add the wine or water and cook, stirring, for approximately 1 minute. Add the soy sauce and sesame oil, then taste and add salt and pepper if necessary. Turn off the heat, stir in the cilantro or scallions and serve. I added some pork into the dish after the vegetables were done and before the rice, cooked to heat it through for 2 or 3 minutes since it was already cooked, and then removed it from the pan and continued the steps. You could just as easily do the same with chicken, beef, shrimp or anything else that you like. I added in some leftover veggies as well like corn and broccoli because it helped to make the side dish one that was then filled with vegetables and rice, meaning I just needed a protein to make the meal. I loved all of the great flavors from the dish with the eggs mixed in and the sesame oil seems to add the perfect touch right at the end to the rice. This is a great way to make use of all of those leftovers you may have in the fridge and just aren’t sure what to do with them. I served this with some steak for a complete meal but really, if you add enough chicken, pork, shrimp or other protein to the rice it can be a one dish dinner all on its own. Not every meal you make has to be a spur of the moment decision for you. In fact, I like to try to plan out the whole week’s menu in advance so I can make sure I have all of the ingredients I am going to need for the week ready and available when I want them. This also let’s me make some dinners that may need a little bit of extra preparation, like marinating or brining, and I know what days are better for recipes where I may need a little bit more time to make them. Planning a meal that involves brining chicken or pork usually gives you 12 hours or a day to get everything together that you need in case you don’t have everything around, along with imparting some great flavor onto whatever protein you happen to be cooking that day. Pork chops are particularly great for brining because it helps to keep the meat moist, plumps up the pork and can give it a much-needed flavor boost when you want it. This particular recipe, from New York Times Cooking and Sam Sifton, does take some planning ahead, but it leaves you with a great combination of juicy pork chops and tasty apple fritters that would make Peter Brady forget all about his pork chops and applesauce meal. In a large bowl, mix the apple cider with 4 cups of water, the sugar and the salt. Toast the bay leaves, chilies, juniper berries, caraway seeds, mustard seeds and coriander seeds in a small pan set over medium heat until you can smell them, then add them to the brine, and stir the mixture to combine it. Add the pork chops, cover the bowl and place it in the refrigerator to brine overnight or for up to 48 hours. To pan-roast the pork chops, pre-heat the oven to 375 degrees. Remove the pork chops from the brine, and pat them dry with a paper towel. Season the meat aggressively with freshly ground black pepper and a little salt. Set a large sauté pan that will fit in the oven over medium-high heat. Add the oil, and when it is shimmering, place the chops in the pan. Cook the chops until they are well seared on one side, about 4 minutes, then turn the chops over, and place the pan in the oven to finish the chops, about 6 to 8 minutes. (The internal temperature of the pork, measured at the center of the chop, should be between 140 and 145 degrees for medium rare.) 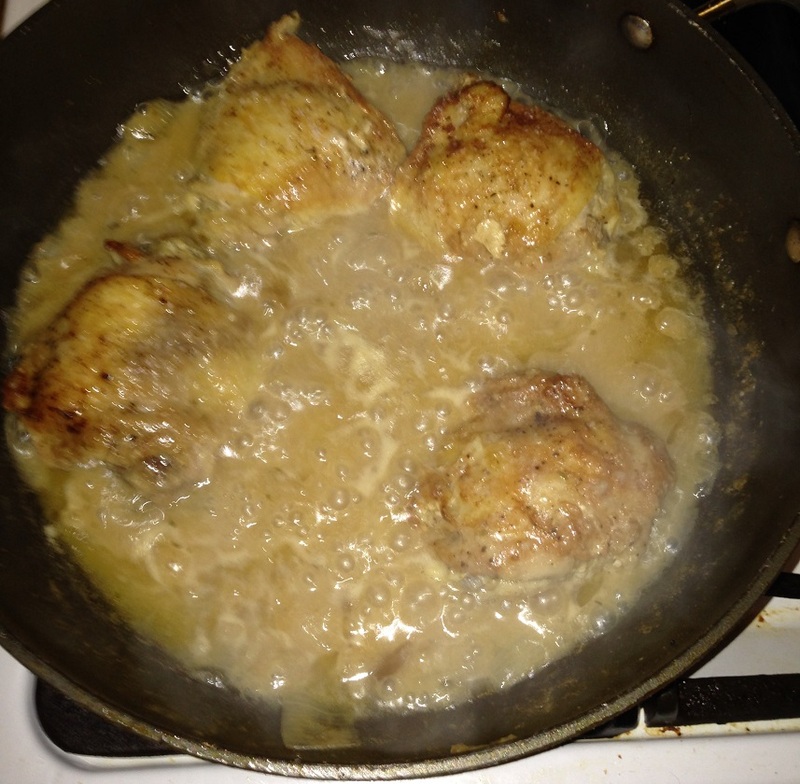 Remove the meat from the pan and allow the chops to rest for 5 minutes or so while you make the sauce. Return the same pan to the stovetop and set it over medium heat, and add the butter, stirring and scraping to incorporate the meat drippings, then add the shallots and the thyme. Cook for about 3 minutes, then add the brandy. Allow the mixture to reduce by half, then add the cream and the stock and reduce the mixture again, until the sauce coats the back of a spoon. Remove the sauce from the heat, and whisk in the mustard and the horseradish. For the apple fritters, heat the apple cider and the cinnamon stick with a couple of inches of water in a large pot set over high heat. Add the apple rounds, and blanch for 1 minute, then remove them to a towel to dry. Whisk together the egg and the seltzer until the mixture is frothy, then gently mix in the rice flour and all-purpose flour. Put the oil in a large pan set over medium-high heat. When the oil is shimmering, dip the apple rings into the batter and fry them in the oil until they are golden brown about 2 to 3 minutes. Serve the pork chops with a few apple fritters and a heavy drizzle of sauce across the top. This meal does take some preparation and you likely will have to get some ingredients you may not always have around the house ahead of time, but it is well worth the effort. The chops have fantastic flavor to them and the sauce for them is perfect, with a great blend of the mustard and horseradish in a cream sauce to really complement the chops. The apple fritters are always a favorite as well and work very nicely with the pork. I served this with some roasted carrots and parsnips and some store-bought pierogies to go along with the meal and it was a family favorite. If you know you have some extra time to make something, this recipe can be a great choice. It is also perfect to serve on a weekend when you might have a little more time to prepare something for dinner or are having people over. It may seem like a lot of work to make the brine, but it is really worth it so you can get the added flavor and extra juiciness with the pork. You’ll be glad you took the time to do it. I was able to find all of the ingredients I needed locally, which isn’t always easy for me, so you should be able to get everything you need to make this dish.